Walk into any restaurant in the Middle East today and you’ll be offered an array of diverse dishes: burgers, kofta, chicken tawook, shwarma, kebab and even pigeon and rabbit. But few restaurant chains offer vegetarian equivalents — ask about non-meat options and you will usually be read a list of chicken dishes. Chicken, it seems, is not real meat. But meat should not be intrinsically linked to piety; there is a colossal distinction between permissibility and obligation. Muslims are religiously allowed to eat meat, but they are not compelled to. They are, however, explicitly instructed not to overeat. With the production of meat as it is today, there are plenty of of good reasons for Muslims to cut down on meat, or even go vegetarian, that stem from Islamic history, Quranic injunctions and problems afflicting the modern food industry. He explains that Muhammad said beef is a disease-producing food, and there is no hadith, or prophetic narration, that indicates that the Prophet ate beef. Both the Quran and hadith clearly outline that most meats are permissible for Muslims, but as with anything that is allowed under Islam, certain conditions must be met. If they cannot, this renders eating meat impermissible. These conditions include moderation, kind treatment of animals and strict slaughter regulations. Islam holds animals in high regard — to such an extent that six chapters in the Quran are named after animals. In Islamic belief, a prostitute was saved from hell because she showed mercy to a thirsty dog by giving it water from her shoe. In principle, Muslims are instructed to be compassionate to all living things. They should not beat, brand or mutilate animals, nor kill them for sport. If this compassion makes a Muslim averse to eating meat, so be it. However, in Arab countries there is very little attention paid to animal rights; animals tend to be categorized as food or pests. In Egypt, for example, zoos are poorly regulated, and the horses and camels which ferry tourists around the pyramids are more often than not covered in burns and sores and severely malnourished. In Lebanon, laws protecting animals haven’t been changed in 60 years. They are more of a guarantee to pet owners than an assertion of the rights of animals. If a pet is killed, for example, the owner can be recompensed 20,000 Lebanese pounds — around $13. 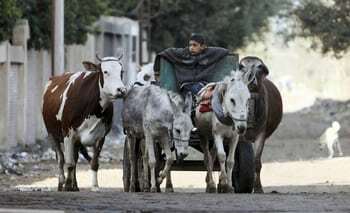 Animal mistreatment in Lebanon is representative of abuse throughout the Arab world — according to the rights group BETA, stray animals in Lebanon are shot, maimed and burned, simply because they are seen as pests. In short, Muslims can’t have it both ways. In order to profess the Islamic right to eat meat, you also have practice the Islamic obligation of kindness to animals, ensuring that they live healthy, free lives — whether they eventually wind up as food or not. Another factor that may push Muslims to question meat heavy diets is the growing controversy over supposedly halal practices as well as problems insuring that food products do not contain pork or other haram (forbidden) substances. A number of halal slaughterhouses have been accused of blasting the obligatory prayer over loudspeakers instead of individually for each animal. Some Muslims have argued that this renders the meat haram, notably a collective of 40 British scholars when they questioned whether the halal branches of the UK’s KFC follow the Islamic slaughter regulations. Last month, an entire brand of (non-halal) beef burgers were taken off UK shelves after it was discovered that they contained up to 40% horsemeat..
Food in the United Kingdom is monitored and assessed by a government department, the Food Standards Agency (FSA), which ensures all food meets rigorous health and safety standards, and that companies are transparent about the food they sell, included all faith-based preparations. With 13 years of experience, they are notoriously rigorous. But last week, it was revealed that some food being served in UK prisons to Muslim inmates contains pork despite being advertised as halal. Most Muslim countries do not perform the thorough checks that the FSA demands. If such a huge oversight went unnoticed for so long in Britain, how can we guarantee that the meat offered in Muslim countries is not also contaminated? Of course, there is no guarantee that meat-free food, such as falafel, isn’t fried in the same oil as meat products, but it is usually evident in the taste. The larger the organization, the further the consumer is from the source of meat and the more room for lapses and contamination. This is a globalized world. Unless it is possible to buy meat from small, animal-friendly organic farms, it is safer, and arguably more Islamic, to eat meat-free food if you want to be certain it is halal. Islam teaches kindness to animals and moderation, especially when eating meat, but this is a message that is all but forgotten in the Arab world. Totally agree with all of the multiple points made here, specifically with the penultimate paragraph “Unless it is possible to buy meat from small, animal-friendly organic farms, it is safer, and arguably more Islamic, to eat meat-free food if you want to be certain it is halal.” I no longer keep a home in UK so, when visiting, I’m normally eating food cooked by someone else, which includes my non-Muslim UK family. Hence it only makes common sense, when in doubt (which is a lot of the time), to go with vegetarian options. Quite often healthier in other ways too.